Dzhohkar Tsarnaev has been sentenced to death for the Boston Marathon bombings. From live tweets of reporters Jim Armstrong and Patricia Wen in the courtroom. 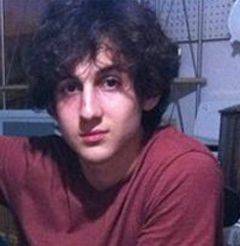 Dzhokhar Tsarnaev spoke for about 4 minutes. He expressed remorse. "I would like to now apologize to the victims and to the survivors." ..."I am sorry for the lives I have taken....for the suffering I have caused and the terrible damage I have done." "I am guilty of the bombing, let there be no lingering question about that." The jury has returned a sentence of death for Dzhokhar Tsarnaev on Counts 4,5,9,10,14, and 15. See Jim Armstrong on Twitter for each finding. The counts on which the jury voted for death pertain solely to Lingzi Lu and Martin Richard. The jury did not return death verdicts on counts with Officer Sean Collier or Krystle Campbell. Only 3 jurors agreed he would not have committed the offense but for Tamerlan. The jury is now deliberating the fate of Dzhokhar Tsarnaev. The Court has published the 24 page verdict form on PACER. Both sides rested their case today in the Dzhokar Tsarnaev trial. Closing arguments and deliberations begin Wednesday. The defense ended its case with the testimony of Sister Helen Prejean. She testified she met with Tsarnaev five times over the past year and he expressed remorse. "He said it emphatically. He said no one deserves to suffer like they did," said Prejean, the public face of the New Orleans-based Ministry Against the Death Penalty and a Nobel Peace Prize nominee. "I had every reason to think that he was taking it in and that he was genuinely sorry for what he did." 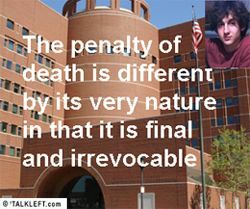 Yesterday and today, the defense in the Dzhokhar Tsarnaev trial presented evidence about life at Supermax in Florence, CO.
Lawyers for Dzhokhar Tsarnaev sought Wednesday to convince jurors in the death-penalty case that Tsarnaev could end up in the country’s most secure federal prison, locked in a cell 23 hours a day, with limited communication with the outside world — if the jury votes for a life sentence. 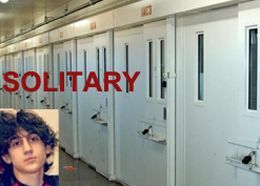 ...Under those conditions, Tsarnaev would be limited to two 15-minute telephone conversations with only immediate family members each month, his mail would be screened, and he would be confined to a single-inmate cell. 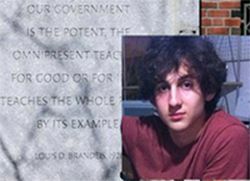 The Government reached a new low in the Dzhokhar Tsarnaev trial this week, in my opinion. At a hearing outside the presence of the jury, AUSA William Weinreib complained about the security costs and FBI time spent ensuring the safety of five of Tsarnaev's relatives who traveled here from Russia to testify for him. They threatened to the FBI will take them back to Russia if the defense doesn't call them by Friday. “It’s an enormous expense and distraction for the agency, and that’s just part of the expense that the government has endured,” federal prosecutor William Weinreb said during a closed-door meeting Monday with the defense and Judge George O’Toole, according to transcripts shown on the court's public terminal. There will be two people fighting for their lives in court this week: James Holmes, the Aurora Shooting suspect who has pleaded not guilty by reason of insanity, and Dzhokhar Tsarnaev, whose defense team will start their case for life. Both begin Monday morning. 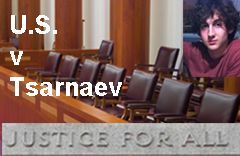 I'm curious to see what witnesses the defense will call for Jahar. I'd like to see his friend Junes Umarov testify for him. I'm sure they've canvassed the friends and neighbors for anyone who can say Tamerlan dominated him and he did whatever he asked. I think we may see some teachers in the early grades, a sports coach, and some high school friends to say this was all out of character from him. Tsarnaev Cell Video : Where's the Anger? 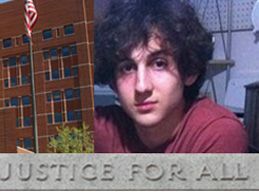 Here's the 36 second video of Dzhokhar Tsarnaev that was played to the jury. I don't see any anger, just boredom. Who wouldn't be bored sitting alone in a holding cell all day? What a big to-do about nothing. The reporter who said his face showed huge anger should cover something other than criminal trials. The Government gave its opening statement today in the death penalty trial of Dzhokhar Tsarnaev. Live updates are here. At the end of her opening, the prosecutor giving the opening displayed a screengrab of a security camera video of Tsarnaev in his cell raising his middle finger to the camera. It hasn't been admitted into evidence, so there isn't a copy, but the media reports it was taken a year ago and shows his face was scarred and he was very angry. The family of Martin Richards, the youngest victim killed in the Boston Marathon bombings, has written a public request asking the Government to withdraw its request for the death penalty. 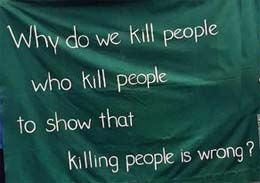 "We understand all too well the heinousness and brutality of the crimes committed. We were there. We lived it.... "The defendant murdered our 8-year-old son, maimed our 7-year-old daughter, and stole part of our soul. We know that the government has its reasons for seeking the death penalty, but the continued pursuit of that punishment could bring years of appeals and prolong reliving the most painful day of our lives." The Richards want Tsarnaev to accept a sentence of life without parole and waive his right to future appeals. AUSA Carmen Ortiz responded with a non-answer. The penalty phase of Dzhokhar Tsarnaev's trial doesn't begin until April 21. In the meantime, here's a photo I came across yesterday. I think it effectively communicates more than the difference in age between the brothers. Tamerlan is just so dominant in the photo. 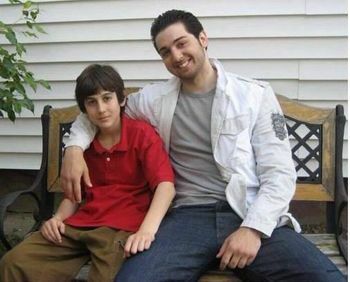 Even the way he has his arm around Jahar seems controlling to me. 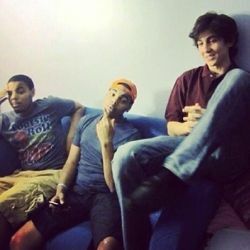 Looking at it, it is hard to see how, even years later, Jahar would be his "equal partner" in anything.